Living a short drive from Enville, but having never played I heard many great things about both courses so I was really looking forward to playing here. 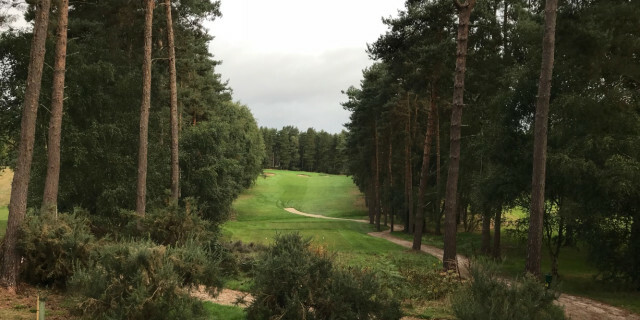 The drive towards the club takes you alongside one of the courses (once played I now know this is The Lodge) and you can see straight away what awaits with gorse and mature high trees in abundance. Once parked up I took a short stroll to a superb short game area, the all grass private members practice facility is considered by many to be the best of its kind within the UK and straight away you could see why! 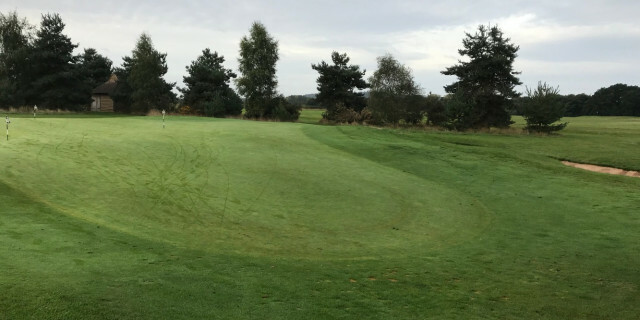 There is a six acre short game area with three full size chipping and pitching greens which stay open all year round and are maintained to golf course conditions. The main long game area covers twenty two acres and is over 360 yards long. The main grass tee is 220 yards long which ensures perfect practice conditions from real turf all year round (plastic mats are never used). I was greeted in the pro shop by Richard Copsey and Simon Isaac, both PGA Professionals, who told me where to go to get to the Lodge. The opening hole is a par 3 of 167 yards to a generous green protected by three bunkers, a well struck mid iron should lead to a starting par. The 2nd and 3rd require accuracy rather than distance off the tee so as not to find the gorse/heather, both greens are again well guarded. After crossing the road you come to the SI1 hole, you now get the feeling you are on a different course as large trees are everywhere creating a great frame to the holes. A long straight drive will run down a huge ravine and leave a short iron back up the ravine to a green that runs away both sides, a par here will leave you a shot up on most. The 5th is a great risk/reward hole. A straight drive may reach the green or leave a pitch in but don't be fooled as the fairway is narrow and the green even though very large is a test for even the best putters with a large slope from back/left to front right. The 6th is again a long par 4 like the 4th that requires a straight ball to give you a chance of reaching the raised green. The 7th is one of only two par 5s on the course and runs downhill with a good tee shot putting the green in reach in two and a great birdie chance. The 8th is a great par 3 playing uphill to a well framed green with pine trees and banking along with two bunkers awaiting anything short. The final hole of the front 9 is a par 4 that doglegs at almost 90 degrees to the right, a par here is a great score. The 10th is the second and last par 5 and is well protected both off the tee by great fairway bunkering and also 70 yards short and in by three more bunkers plus another short/right by the green. 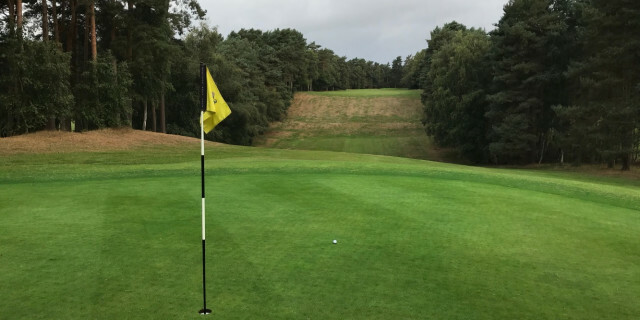 The 11th and 12th are both par 4s around 400 yards that require a straight tee shot to enable any chance of hitting the green especially on 11 as large trees to the right shield the second shot. The 13th is back over the road and into the heathland part of the course once more. Heather lines the hole on both sides and the green is again protected by a bunker left and right. 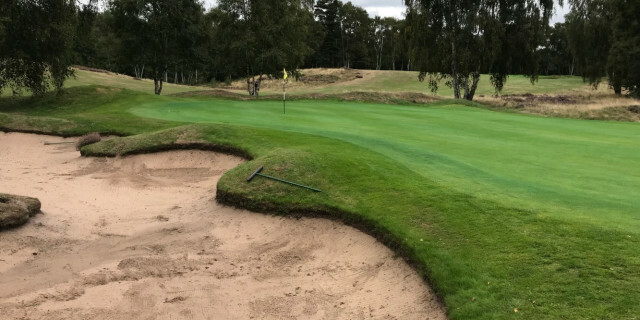 14, 15 and 16 are all par 4s framed by heather, greens protected again by well placed bunkers and the 16th green is one of the best and trickiest on the course. 17 is the final par 3 and again a great hole with the green protected by bunkers with heather also around the bank to the rear. The finishing hole is a relatively short par 4 but again it is framed on both sides by trees and the green is protected by three well placed bunkers. Th green itself runs away from you so a well hit approach shot is need to avoid running through the green and inmto the trouble that will lead to a bogey or even worse. The whole condition of the course was great, the greens receptive, true and quite quick, teeing areas all very good. Some great bunkering on nearly every hole. Very friendly reception before, during and after the round by all staff, members and visitors. A great looking clubhouse with one of the best stocked pro shops you can wish to find. The 4th hole even though being SI1 was my personal favourite with trees lining the hole on both sides and the huge ravine around 100 yards short of a superbly framed green. The front 9 was my favourite as it had a great mix of heathland holes and woodland holes. Very pleasing on the eye but at the same time very demanding for all aspects of your game. 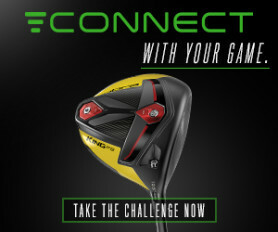 This course would be playable all year round and would be a good challenge to all levels of golfer without being too tough for higher handicappers.